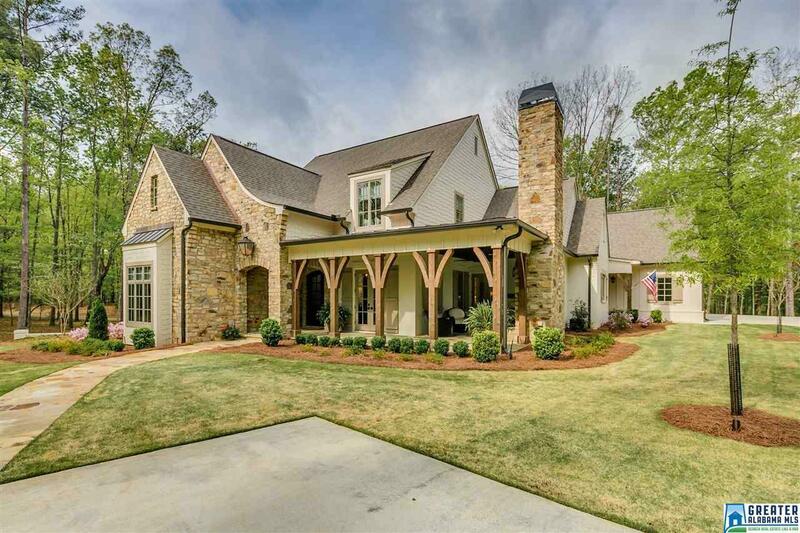 One of Southern Living&apos;s most popular plans, professionally decorated, only 1 year old w/beautiful outdoor living spaces which include inviting front porch & patio & fabulous screened oversize back porch w/flagstone patio both have fireplaces. Quality built by one of Birmingham&apos;s finest builders! Open Plan, high ceilings, hardwood, stone & tile floors, top line light & plumbing fixtures, quartz & marble counter tops through-out the kitchen, laundry and baths, new modern colors & a ton of windows to let the natural sunlight in! Formal dining room w/butlers pantry, great room has vaulted ceiling w/wood beams & beautiful stone fireplace, opens to eat-in kitchen w/Wolf, Bosch & Sub Zero stainless appliances. Oversize master suite has custom shower, soaking tub, double vanities & 2 large walk-in closets. Second ML guest bedroom (currently set up as office) has full bath. Upstairs features den, 2 bedrooms, 2 baths plus large rec/play room. Beautiful professionally landscaped 1.9 acre lot. Driving Directions: 280 To Hugh Daniels To End, Turn Left, Shoal Creek Will Be One Mile On The Right.